Storytime Issue 54 is out now and it’s an issue that makes us immensely proud. After years of featuring famous fairy-tale princesses – the ones that get heaps of book, film and magazine coverage – we’re finally featuring a fairy-tale heroine we can relate to. Say hello to Molly Whuppie – vanquisher of giants and all-round cool kid. She’s brave, clever, witty and generous. And she appeals equally to boys and girls. Can you believe her story is over 100 years old? It makes you wonder why you don’t hear of her more often. Somebody write that film script now please. 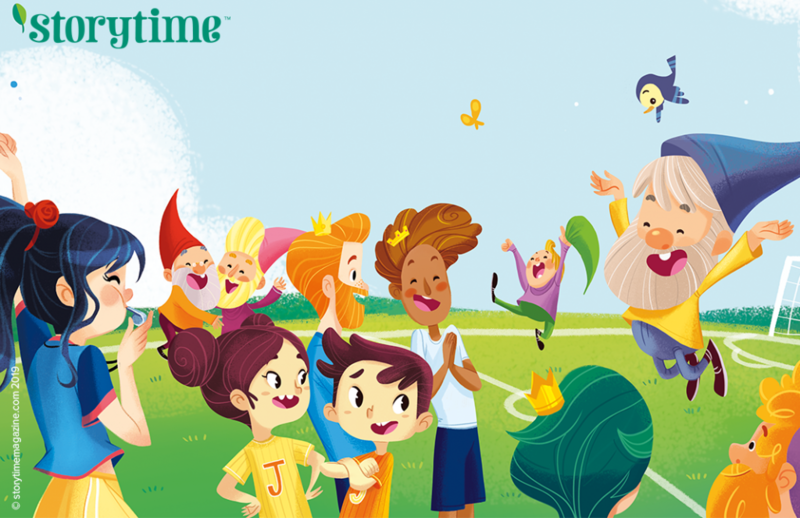 Molly may be the star of Storytime Issue 54, but she has a rich and varied supporting cast – all brought to life by our team and incredible illustrators from all over the world. This issue also includes the winner of our 50-Word Story Competition. Sophie Morgan Illingworth wrote the fun and clever Storytime Disaster, which was illustrated by Storytime favourite Gaby Zermeno, who has done a wonderful job of creating images that spring off the page. As well as having her story published in Storytime, Sophie won a special certificate and every Storytime issue we’ve ever printed for her collection. Congratulations, Sophie! 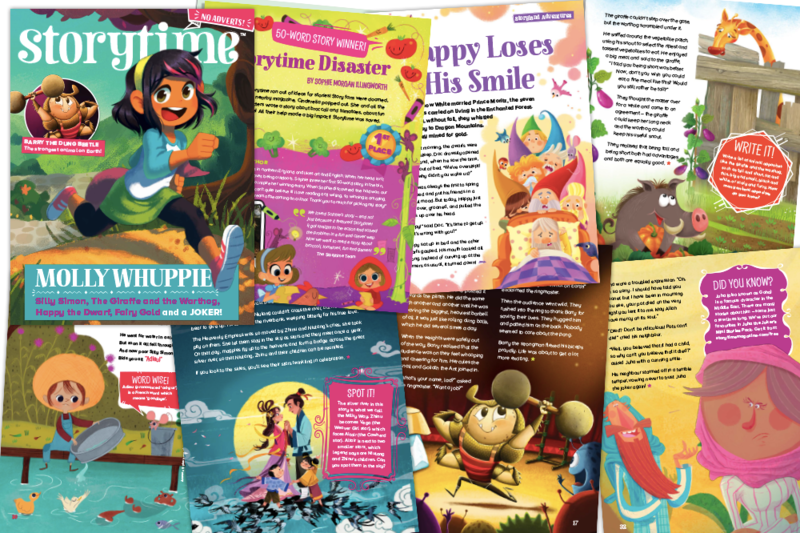 Find out more about the rest of Storytime Issue 54 here. A scene from Welsh folk tale Guto and the Fairies. Art by Federica Tanania. Our issue kicks off with a smart but simple lesson. Storytime Issue 54’s Famous Fable is The Giraffe and the Warthog – a tale about appreciating what you’ve got and accepting what others have too. Illustrator Nguyen Phung Quynh gave us animals bursting with character. In Guto and the Fairies – an old folktale from Wales – a young boy encounters fairies in the Welsh mountains. Nobody believes that friendship with the fairies can come to any good, but Guto proves them wrong. We love Federica Tanania’s artwork for this. In our classic poem, Silly Simon (same poem you know and love, but with a more sensitive title), Simon gets up to all kinds of silliness. 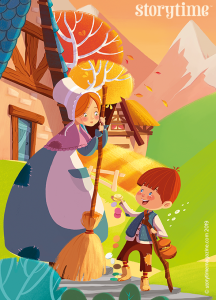 Kids will enjoy his lack of common sense and everyone will love Marisa Morea’s cute illustrations! As mentioned, Molly Whuppie is Storytime Issue 54’s true heroine, along with Lucy Xue who provided the illustrations. Our lucky school subscribers will receive a free teaching resource pack to go with this story, which has lot of activities for the classroom. It comes with reading comprehension tasks, storyteller cards, writing prompts and much more. We’ve also started putting together a glossary covering tricky or new words across the whole issue. Find out more at our dedicated schools site. From further afield, we bring you Juha the Joker – a legendary trickster figure in the Middle East. This story is super-simple but very funny – we think you’ll enjoy it! Tel Coelho gave Juha his mischievous look. Make sure you download our extra mini Juha stories from our freebies page too. In our latest Storyland Adventure, illustrated as always by Giorgia Broseghini, Happy of the seven dwarfs wakes up and… shock horror… he’s feeling unhappy. The dwarfs’ usual routine is thrown into chaos, but can they help him find his happy again? You’ll have to read it to find out. However, we can tell you that it involves a great football match. Is Happy the man of the match? Find out in our latest Storyland Adventure. Art by Giorgia Broseghini. Finally, we always like to put in a tale of love for Valentine’s Day and Storytime Issue 54’s is rather special. The Cowherd and the Weaver Girl is a classic Chinese legend. It’s so famous, it’s celebrated every year. It might make you look at the stars differently. The wonderful Hahn Dung Ho illustrates this story beautifully. With stories from Wales, China, India (our fable), the Middle East and the UK, we’ve travelled far and wide to bring you the best bedtime stories in the world. We hope you enjoy reading them as much as we loved putting this magazine together. And, don’t forget, we have our usual mix of activities, a game, crafts, book recommendations and educational ideas too. May you whup some giants this month!